Yeah I know it's not terribly "spooky", except maybe that tree in the background. At any rate this image will also serve as my Halloween mailer so. . . HAPPY HALLOWEEN! I do love Halloween. Hopefully everyone is getting their costumes ready, and not just going as "an un-costumed person". Be safe! This year I'm going to be more fun than a barrel of monkeys. Or really, I'll be just as much fun as a barrel of monkeys. Because I'm going to be a barrel of monkeys. This is such a fun piece. Great magic you have created with this one. I really like the colors and composition. Great job! very cool illustration and in a strange way it reminds of the old Nintendo computer game called 'Ghosts and Goblins' - awesome! Well, with that spooky background the fun may be over soon. Love it. 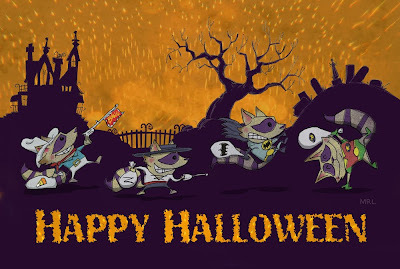 Great illustration, so cute and fun and a little spooky.